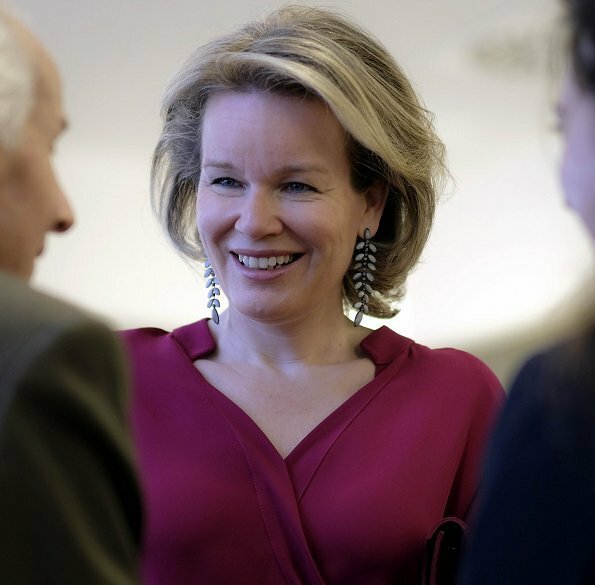 Queen Mathilde of Belgium visited the 6th World Homeshare Congress of 1Toit2Ages, in Brussels, on March 21, Thursday. 1Toit2Ages is an association that aims to break the loneliness of the elderly and facilitate access to housing for students. The association organizes intergenerational, shared housing projects in which students live with seniors. The project was started in 2009. Grandparents have always welcomed young students, grandchildren or not, into their homes in a spirit of mutual support. Wow she looks fantastic. Mathilde is just so lovely and polished. Mathilde looks wonderful. Love the color of the blouse nice earrings and very lovely smile. Perfection, stunning dress and blouse on Mathilde. It looks as she lost some weight, good for her. Wonderful blouse, bag and earrings. Not forgetting her wonderful smile.